Beat Detection iExpressions can be applied to properties which represent the audio amplitude of some music (i.e. properties which you created with the function 'convert audio into keyframes' of the keyframe assistent). They can detect the beats in the music such that you can animate various properties according to the music. The beat detectors just recognize the beat and don't do any animation, yet. You can animate properties using other iExpressions (like the 'Change on Beat 1D') which are then linked to the beat detector. This setup allows to animate several properties according to the same beat. 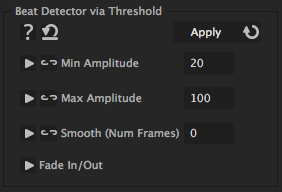 The 'Beat Detector via Threshold' detects all parts of the audio as beat, whose audio amplitude is inbetween 'Min Value' and 'Max Value'. This beat detector is hence best suitable to detect parts of the music whose loudness significantly differs from the remaining audio. It can also be used to detect silence (for example for automatic lip sync animation which should only be active when there is no silence). denotes the minimal audio amplitude of a beat. Everything that has an audio amplitude in between Min Amplitude and Max Amplitude is considered as a beat. denotes the maximal audio amplitude of a beat. Everything that has an audio amplitude in between Min Amplitude and Max Amplitude is considered as a beat. allows to do not consider the audio amplitude of the current frame, but the average of the sourrounding frames. Large values hence allow to identify parts of the music as beats which have a characteristic (average) volume, wheras small values allow to react to quick changes in the audio amplitude. This tutorial by Brad Magnus shows how to use iExpressions and 3D Extruder to make a sound syncronized kinetic type animation.